Thank you. You are the survivors of our Artha Forum! I thank you and I congratulate you. It has really been a joy, I think, for everyone. The enrichment of sharing our realizations with one another has been a very growing and enlightening experience. 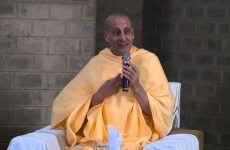 The concept of the Artha Forum is very much the inspiration of Rajeev and Sanjeev and several others who have great, deep devotion to the principles of Bhagavad-Gita. 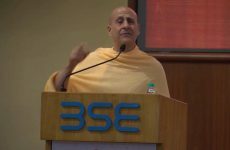 As His Holiness Bhakti Rasamrita Maharaj was explaining, spiritual solutions are very much required within this very chaotic world we are living in. How to actually see the true equality of all beings?! Then compassion is not just a mental exercise, it’s not just something regulated by government officials, which is necessary. As was said, in the absence of an enlightened monarch, democracy is the best thing there is. But the Bhagavad-Gita teaches that each and every one of us as human beings has a responsibility to everyone else. Nature, when we have a spiritual connection, we see it all as God’s nature. My Guru Maharaj Srila Prabhupad, he used to say, “When you talk about nature, the natural question is, ‘Who’s nature?’ You have your nature, he has his nature, she has her nature, and I have my nature. This is God’s nature – the sun, the moon, the clouds and the rain, mother Earth, and every living being.” Whether you are an insect or whether you are a PhD, human, we all are equally, totally depend on the gifts of nature. We all depend on the air, on the water, on the food, on the sunlight. From a spiritual perspective we understand our intimate relationship with each other and when we learn to love God, who is the root of the tree of all existence, then naturally that love must extend unconditionally to everyone. And that is the fullest, deepest, compassion. And what the spiritual science tells us is, it is the potential of each and every one of us. It is not just a concept; it is not just an impossible theory; it is who we really are. It simply needs to be uncovered. And true spirituality is not about being a Krishna or a Muslim or a Jain or a Jew or a Sikh or a Parsi. True spirituality is about excavating that wealth that is inherent within each of us, and as we discover within ourselves, we can actually recognize it within others. I have a dear friend Shyamsundar. I was with him just about a week ago. He was the personal secretary of my guru Srila Prabhupad for many years. He’s now writing a book. He is one of the world’s foremost geologists. And I remember: one time I was driving with him in British Columbia, Western Canada, and there were just mountains. And I am looking at the mountains and I’m just seeing mountains. And he’s telling me, “There is sapphire in that mountain.” And he’s telling me which minerals and which jewels are in each mountain. All I see is mountains! I said, “How do you know?” He said, “Don’t you see that the color of the stone in that mountain right there?” And he was showing me the things that we ordinarily see. I was seeing the same colors as he was, but I was just seeing color. He was seeing what it indicates, is inside, because he understands the science. So the spiritual science teaches us to actually be able to see the divinity within all living beings and we also see what kind of coverings. This eco-village, it’s a community – we have an orphanage, we have a monastery, we have so many families living. We are trying to live in a sensitive way that’s more harmonious with nature, to this concept of symbiotic biotechnology, or something like that, where we understand the value of everything. I’ve been in this little body of mine for 64 years. I’ve never seen any of these things give any sustainable happiness to anyone, and according to the Scriptures that is a correct analysis. What are we looking for? We are so distracted, bombarded by these weapons of mass distraction constantly. So many promises: ‘if you have this you’ll be happy’, ‘if you get this you’ll be happy’. But the Bhagavad-Gita teaches us very clearly: “all these acquisitions and the need for them is like putting fuel on a fire.” The fire is never satisfied, whether you are a millionaire or a billionaire or a trillionaire or a quadrallionaire. In our Vedic scriptures, even Indra – he’s more than a quadrallionaire – but he’s always getting in all kinds of trouble, because he is still not satisfied. What is the story of Nara Narayan Rishi? 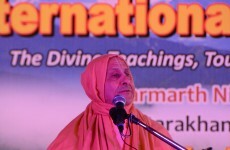 Nara Narayan Rishi is an avatar, written of in Srimad Bhagvatam and other Scriptures. He was living in Badrikashram, Badrinath, and performing tapasya. But Nara Narayan Rishi were performing tapasya for the purpose of giving blessings to all living beings within the creation; were hardly eating. Badrinath is cold; they didn’t have any warm clothes, they didn’t have any house. So such severe austerity! Indra was thinking, “He must want my kingdom! That’s why he’s doing this tapasya. 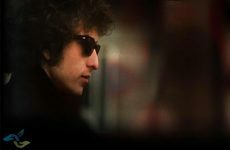 He’s trying to get power to conquer me.” Because you see, the whole world is a mirror of our own state of consciousness. If we have envy, we see so much envy everywhere; if we have greed, we will see so much greed everywhere; if we are looking for opportunities for seva, for selfless service, we will see limitless service everywhere. So Indra, because he so attached, he so attached to his wealth, his power, his beautiful ladies that he enjoys with, he was thinking, “If Nara Narayan Rishi is working so hard with this tapasya, he wants what I have.” So he tried to somehow or other pollute Nara Narayan Rishi by sending every kind of incredible temptation – best he had in the heavenly world. He surrounded Nara Narayan Rishi in Badrinath to seduce him, and nothing worked. Finally created incredible… he sent the most beautiful lovely ladies who were singing and dancing around Nara Narayan Rishi. And Nara Narayan Rishi, he smiled and he created a lady that was millions of times more beautiful than all of Indra’s. Just created and said, “Indra you take her. I don’t want anything you have.” Because he was self-satisfied. Krishna tells in Geeta that when we experience a higher taste then we are no longer corrupted by the things of this world. And that higher taste is what is within us. So much of the problem of the world today is a misconception of real wealth. What is it? Real wealth is not about things. Real wealth is about our values, the inner love, happiness and contentment that we find. It’s not subjective to circumstantial situations of this world. That is real wealth, because ultimately everyone’s looking for pleasure, not just the pleasure of touching things or seeing things or hearing things, but the pleasure of what’s within our own hearts, because nothing could touch the heart. Only God’s love could touch our heart and the greatest happiness, when our heart is clean, is to make that connection and share it with others. The Artha Forum is a group of business people who really have this spirit. They are, they have children, they have husbands and wives, they are really dynamic and competitive in their fields, whether it be investment or software industry or banking. And they are dynamic, they are powerful, they are competitive, they are aggressive, but like Arjuna. Arjuna was really aggressive, and he was really passionate, but not out of arrogance and ego – out of compassion. So just like a mother is so highly motivated 24 hours a day to take care of the child, so similarly, whether we are in business or politics or farming or agriculture or in science, education, weather, we are sadhus. The greatest motivating force is to acquire more and more and more, so that I can be a more benevolent, efficient instrument of the grace that is higher than me, that’s God’s grace. It has been quoted many times during this conference – tat tat evetaro jana. The Gita tells that what leaders do, common people follow. The idea of Artha Forum, in these conferences is, yes, to inspire people who are like-minded and to keep us individually and collectively focused on these higher values of life so that through our example and through our character we can share with the world. Because, as has been explained by many, anyone can preach with their words, that’s called gyan. 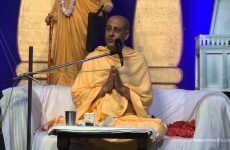 Maharaja (Bhakti Rasamrita Swami) was describing there are two types of gyan – there is gyan and vigyan, there’s theoretical knowledge and there’s realized knowledge. When we practice knowledge, we get realization and when we practice, we give hope to people. In our little eco-village here, at one time we were insisting on organic farming; we had some village people because we had a few different incarnations of this farm. And they from their childhood they were made to believe it is impossible to grow crops without chemical fertilizer and chemical pesticides. ‘Can’t be done!’. We told him, “You’re not allowed to use.” They said, “Who are you? You people are living in the cities; you’re from other countries. What do you know? What do you know? We are farmers.” I heard. Because we wouldn’t let them use fertilizers and pesticides, sometimes they would secretly go out in the middle of the night and spray because they didn’t believe it could be done. We had to send a lot of them home and get people from the city to come, who never farmed before. And they started growing wonderful crops, totally organically and then the villagers thought, ‘It actually can be done!’ Seeing is believing. Water harvesting! Drought is a major cause of poverty. In Maharashtra farmers commit suicide, farmers leave their beautiful land to go to live in a very, very overcrowded filthy place in a city like Mumbai and become beggars. Because there’s no water, nothing grows. But the same monsoon rains come here, it’s all here, but instead of just walking around with an umbrella thinking, “Oh it’s raining again,” every drop of water is the gift of God. If we understand its value, we will do something. So because our water harvesting project is actually, is fertilizing and nourishing the crops throughout the entire year, even through the summer, people see this. If we tell them water harvesting, it doesn’t register. When they see an example of the knowledge, now more and more of our villages in the area are allowing us to help them to develop water harvesting. It’s a principal. This eco-village is not just alone for ourselves to live peacefully in an environmentally friendly setting; we are trying to create an example that people can find hope and faith in. When the ecology of the heart is polluted by this envy and arrogance and greed and everything else, that’s all we see. Lord Chaitanya Mahaprabhu explained the mind is like a mirror. When you look in a mirror you’re supposed to see yourself. But if the mirror is completely covered due to neglect with layers and layers of dirt and dust and debris, that’s all you see. And you look at the mirror and you see all this dust, and you think, “That is me!” We are thinking, ‘I am male, I am female, I am human, I am black or white or red or yellow or I am richer, I am poor.” We are thinking, “This is me. I want this. I don’t want this. I love this person. I hate this person.” We are identifying these things. “This is mine, and this is his, and this is hers.” This concept creates so much arrogance and so much envy and so much depression; it’s all pollution. True dharma is the path of cleaning the mirror of the heart. This chanting of God’s names… In our tradition we chat Hare Krishna, Hare Krishna, Krishna Krishna, Hare Hare, Hare Rama, Hare Rama, Rama Rama, Hare Hare. So the Artha Forum is a group of people who want to share this wealth with each other, and through what we all receive, in whatever small or big ways, whether they are incremental or whether they are something wonderful in a bigger way. Big or small is not really important. What God gives us, we want to share. And the reason why these beautiful conferences are happening is because people like Rajeev and Sanjeev, they live by these principles. Their greatest joy, their greatest motivation in life is, through their example and through whatever God gives them, to share, to serve. This is such a beautiful spiritual principle. I think I’m supposed to speak something about what we can take home. Well, my first request is, please make this eco-village one of your homes. It’s ours. And the real beauty of this conference is how we each take responsibility in this spirit of seva and how we share with each other and how we try to share it and inspire people of all walks of life of the world. I’m going to end with one little example of something that happened about a month ago. There was a person who came here to the eco-village. In some circles he is very well known worldwide. His name is Jason Lewis. He’s the first human being to circle the earth on human power. How many of you have heard about him? Please raise your hands. I never heard of him before either. He is British, and he decided to go around the world by human power. That means without any motorized anything. Do you know he crossed the Atlantic Ocean? He personally made a little boat, 3 feet wide 16 feet long, and he put a little bicycle pedals with the chain and a little, what you call it, propeller behind it. That was only going around according to how he was peddling. He crossed the Atlantic Ocean on that. It took him 110 days. Then he crossed, he arrived and he went from Portugal to Miami. He went across the entire continent of North America on roller skates. Then he made another boat. The same thing with the paddles and crossed the Pacific Ocean. He had a partner up to Hawaii. Then at a certain point his partner said, “I’ve seen enough of the world!” So he was all alone on this little boat, peddling and peddling. And it’s not that he had some big boat with the motor next to him, by throwing them food and everything. He was alone, his radio would only contact anything that was close by. Most of the time he was totally isolated; he had to figure out. He told me one story. He said he was in the middle of the Pacific Ocean, somewhere near Fiji, that area. And there was a current that was pushing the opposite direction. So he would paddle 18 hours day and then he would have to get some rest; and whenever he took rest, boat was behind where he started from. The next day, the day before. He was getting nowhere, and he peddled another 18 hours. He took a little rest and woke up and the boat was behind where he started the day before. Five days went by; he didn’t make 1 inch of progress. And there is no one he could communicate with, and he is all alone. And he’s in the middle of the Pacific Ocean. Would you get discouraged? 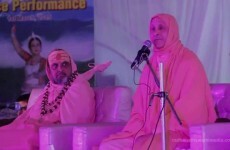 He got discouraged, but he was a student of Bhagavad-Gita, even though he is a British person. And he remembered, karmanye vadhikaraste, in this beautiful verse in Gita that said, “Do not be attached to the results of your actions. Just perform your duty for Krishna’s satisfaction.” That gave him so much joy. ‘As long as I’m attached to progress, for getting, I’m really discouraged. But if I just paddle for the sake of paddling, because that’s my duty, then I will never be discouraged.” He was completely, ecstatically just peddling and peddling. It doesn’t matter if I get anywhere, because I’m doing my duty. And for the next 18 days he was brought back behind where he was. But it didn’t matter to him, because, ‘I’m just peddling.’ But that was the strength and the inspiration that he got for the rest of his trip: not to be attached to the results. So even though the next 13 days after he became inspired by this verse of the Gita he didn’t get anywhere, but he was completely enlivened to go out the next day. And he didn’t know in his lifetime if he would ever get anywhere. But what a realization! It transformed him, and he shared it so it could transform us. Do you know why he came to this eco-village? Because when he was doing his journey, which by the way to circle the world one time it took him 13 years nonstop, he came to Kanyakumari and pedaled a bicycle to the Himalayas. And on the way one of the things he saw how cruelly abused, exploited donkeys are. Now here is a person from Britain, who is an author of books, who is on international television because of his journey. He saw in our website or something that we have donkeys that we take nice care of. ‘In India they are taking care of donkeys?’ That was such a cultural experience for him. He just wanted… he saw a picture of these donkeys that were like combed nicely. And his wife Tammy is an animal rights activist. So they decided, ‘We want to go there and honor those people who are taking care of donkeys.’ And they came, and just less than a month ago, I was in Mumbai when they came. And I came the next day, and when I came they were crying, talking about how they never saw such happy cows. He went on and on for a half hour about how elated they are to see the cows. The cows are so affectionate…. Because now they live in Colorado, in England… now the cows in America, they know they’re going to be slaughtered, they have that intuition. Whether they are dairy cows or whether they are in the meat industry, hundred percent they all get slaughtered. It’s just a matter of when. So these cows, you could see, you could feel that they are loved, because they are loved. They are so fearless and so happy and so protected. And they went on and on and on, up to the saying, “We are so grateful to see what’s happening with these cows.” And I said, “What about the donkey? You came to see the donkey.” “Oh!” they said, “Yes, yes. The donkeys are very nice and very happy, never saw a brushed donkey before.” In other words, they came because of something that they believe was based on a higher value, and then they can appreciate everything else. It’s quite amazing, because he’s very influential. He said, “Wherever I go in the world, I am gonna talk about the compassion you have for your cows and donkeys.” So one person’s heart is touched by just little example of a smiling donkey, and when we are inspired by that example, we become instruments of those values. And the Artha forum is a forum in which we come together to try to nourish the art of giving within each other, the art of serving within each other. And our home become beautiful wherever it may be. 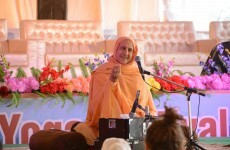 When we can share this culture of devotion with our families, with our friends, with the society around us, in whatever our occupation is, through our words, through our actions, through our prayers, because each and every one of us when we connect with grace, grace is the sweetest, most beautiful, fragrant, power in all of existence. And there’s no power stronger than grace. When we connect to that grace and help each other to connect that grace individually and collectively, we really can make a difference. In Mumbai there’s the Birla house and sometimes I go there to do programs. And they showed me one room, and in that room Ghanashyam Das Birla, he used to bring just a few people – Gandhi, Nehru, Patel – they would all sit together to discuss this idea of ‘Quit India’, the freedom from the British rule. Just a few people coming together with an idea and a determination, and little by little, through their words, through their actions, it conquered the most powerful empire in the world, at that time the British Empire. In America we were under the British Empire too, just like you were in India. And just a few people – Thomas Jefferson and George Washington – these people they just came together in little conference and said, “Let’s make a declaration of independence.” It seemed completely insane and crazy, but they believed in it and through their dedication they got many people behind them. Many of the greatest scientific breakthroughs began with just one person sitting in a laboratory not willing to give up. So we should have hope, no matter how much greed and corruption and everything else there is in this world. We should have hope that if we just keep peddling in that boat… Pacific Ocean is big, the current was stronger than our friend, but he didn’t give up. Because he had hope, and this wonderful forum is an opportunity to come together to try to share with each other, wisdom, experience, realization, ultimately to bring us hope that each and every one of us, we can make beautiful difference if we value the wealth of love, of service, Thank you very much.